Records show that Tamiami Airport was built sometime between 1944 and 1947 and featured 3 short runways. The airport was on land adjacent to Tamiami Trail. While this location was the original home, the location was relocated to a site more suitable in 1967. 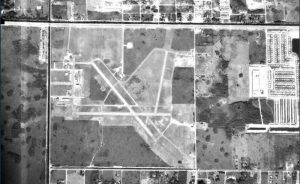 Image shows an aerial view of the original Tamiami Airport before it moved to its new and current location.